We’ve been repairing carpets in Burton-upon-Trent, Tamworth and the surrounding areas for more than 30 years and during that time we’ve come across probably every kind of damage you can think of. However, one of the most common is iron burns. 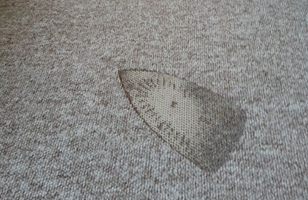 Being met by that all too familiar triangular shaped scorch pattern on a carpet is a regular occurrence for the Carpet Surgeon team. And while that’s unfortunate for you and your carpet, the good news is that we are experts at carrying out seamless carpet repairs for iron burns. The same goes for all other kinds of burns and scorch marks, whether they’ve been caused by straighteners, cigarettes, or a live spark. 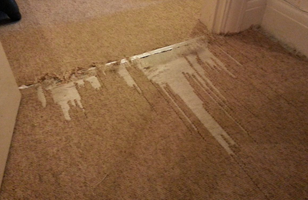 We can repair your damaged carpet in no time, eradicating burn marks and leaving your carpets looking like new. This means you don’t have to make a costly claim on your insurance or fork out for a new carpet. If you have dropped the iron on your carpet, the first thing we need to do is examine the burn damage. You can send us a photograph if that’s easier and we can determine the best method for repairing your carpet burn. This could be involve integrating a piece of left-over or matched carpet into the existing carpet, re-tufting, patch repair, or, most likely, micro-shearing. 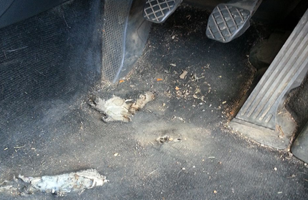 Because we have been carrying out carpet repair in Burton for so long, we know all the best methods to use and have the best tools and techniques for the job. This includes the amazing micro-shearer and this nifty piece of kit has come to the rescue for many an iron burn disaster. A micro-shearer is a specially-designed machine that trims the uppermost fibres of your carpet using sharp, precisely-angled blades, allowing total control by your Carpet Surgeon. It’s perfect for repairing iron burns as they often leave the carpet fibres singed or melted, depending on the type of carpet you have. The micro-shearer microscopically trims those damaged fibres with millimetre precision to reveal the undamaged fibres beneath. This can be done to a depth of around 3mm if needed and therefore also works on deeper scorch marks, such as those caused by hair straighteners, cigarettes or sparks. The area around it will also be feathered out, resulting in a seamless repair that is invisible to the naked eye. This is an easy, quick and affordable repair for iron burns. As well as tackling carpet burns, micro-shearing is also great for freshening up the overall appearance of your carpet, giving tired, worn carpets a brand new lease of life. Because it trims away the top layer, micro-shearing can remove fluff, carpet bearding and bobbling and make it look new again. Micro-shearing is obviously much more affordable than re-carpeting and is a great way to extend the life of your carpets. Experts in carpet burn repairs, Carpet Surgeon can help you with your carpet repair in Burton-upon-Trent and surrounding areas.